The winds were onshore this morning, so our Zodiacs surfed the breaking waves onto the Iron Strand beach to be caught by the welcoming committee, led by our fearless leader, Dennis Mense, himself, chest deep in the frigid water. Finally, our feet were on the soil of wild Labrador, a land brought to life by Gabrielle Roy in her novel, Windflower, which we had recently read. Windflower tells the story of an Inuit woman and her mixed race son, vividly capturing the clash of traditional society and the modern world. If you are coming to Labrador, you should read this book. 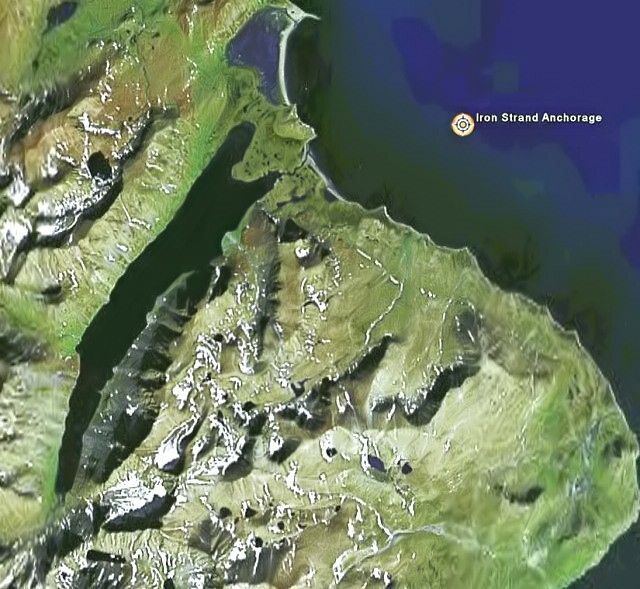 On January 22, 2005 there was celebratory throat singing, drum dancing, tears and laughter throughout Labrador at the signing of the Labrador Inuit Land Claims Agreement which included an apology from the Provincial Government for Inuit peoples resettlement and established the Torngat Mountains National Park Reserve. The sand of Iron Strand is a reddish colour as a result of the substantial presence of garnet. A survey in 2004 by Freeport Resources reported 65% almandine garnet and 4.12% TiO2 along the 860 meters of beach surveyed. They have staked a claim for intended placer mining of the beach. 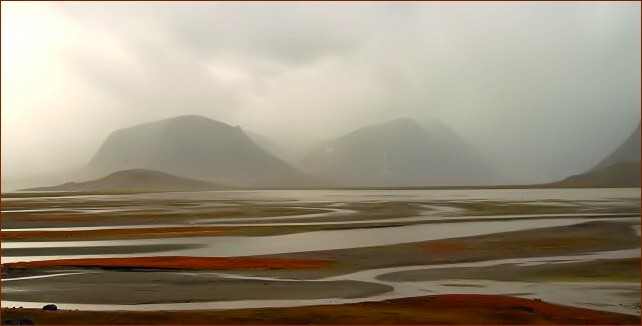 Although the beach falls within the Torngat Mountains National Park, there is currently an exemption for mining this beach, according to the Protected Areas Association of Newfoundland and Labrador. The Inuit harvested the berries during the late summer and stored them in sealskin pouches in pockets of frozen tundra to give some added interest to the tedious diet of seal and fish during the long winter months. 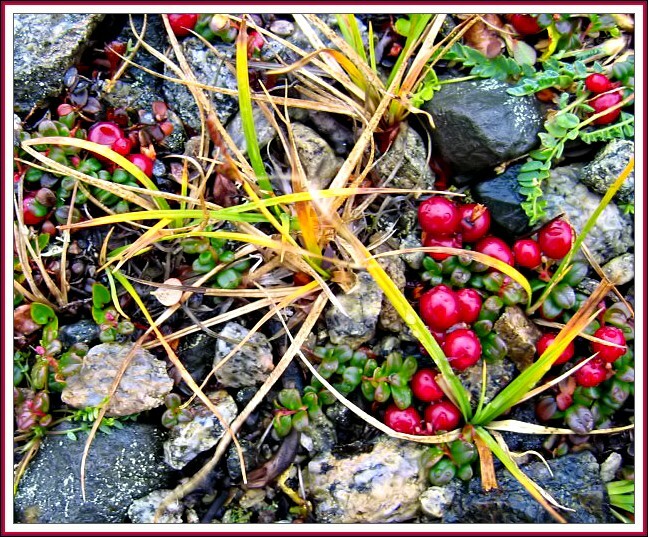 Cranberries were also harvested. 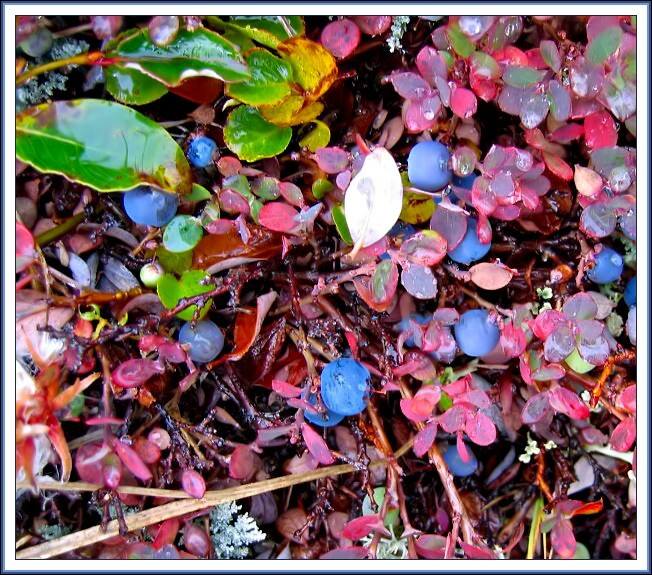 Their tart flavour must have been a welcome counterbalance to the fatty food, while the mixture of salmon spawn, blueberries and seal fat was likely quite a gourmet dish for the coastal Inuit of Labrador.